I watched the Prophets of Doom show last night on The History Channel. It was well done. Six white guys sitting in mismatched chairs in what looked to be a rundown warehouse discussing what will do us in first: loss of clean water, Peak Oil, overpopulation, economic collapse, nuclear terrorism, or artificial intelligence run amok. My vote (if I had to name one is Peak Oil). But these and other calamities are all interconnected. I do find it interesting how much energy is spent either denying or arguing the obvious. Buddha gave us the basic reality check: Nothing is permanent. You will die. I will die. Everyone we know will die. Everything that has been built will be destroyed. Every civilization will collapse including the present one. The American Empire will crumble. Earth itself will die. What we don't know is when and how. We also do not know what green shoot will sprout from the charred stump. The challenge for us is to somehow keep our sanity when faced with impermanence. How do we cope when we desire what cannot be, that is for life to remain the same? Buddha realized that this desire is the cause of our angst. End desiring for what cannot be and you are released from your angst. Easier said than done. That is why the Buddha way is not for wimps. It takes a lifetime of practice to tame desire. But we can tame desire, at least a little. We can recognize the truth that life is change. Life is impermanent. Knowing that my life will end and so will the lives of those I love and so will everything I hold dear can help me appreciate all of it now. At this moment I have breath. At this moment this incredible civilization exists in all its complexity. It is quite amazing. Apocalypse is a word that has a number of meanings. Technically it means revelation. It is insight or special knowledge. It is an "Aha!" What has been concealed is now clear. In the Abrahamic traditions it refers to a revealing of "the end". We often use the word in terms of a violent or destructive end. But that isn't necessarily so. The Apocalypse of John is the last book in the New Testament. It tells of a revealing of the end to John on the island of Patmos. While it has a number of puzzling symbols the story ends with the revealing (apocalypse) of a new heaven and a new earth and the tree of life that provides healing for all nations. For the Apocalypse of John, the message (the revelation) was that what seemed like a powerful and permanent reality, the Roman Empire, was not permanent. That message is true for us today. Apocalypse and impermanence are related. Both concepts have to do with a way of seeing the world and living in the world and living one's life with the knowledge and the wisdom that what we see is not lasting. It will end. As we see that, we can gain insight into how to live in the present and how to prepare for endings. How do we do that? Both Jesus and Buddha taught us to be aware and to be awake. There is no need to panic. No need to live in denial. We seek to be a non-anxious presence in the present. We practice creativity in the service of compassion for all living things. Awake and aware people are showing us one sign after another that our globalized industrial civilization (the age of Petroleum Man) is coming to an end. Not "the" end, "an" end. While many are making educated guesses we cannot really know how or when. And we don't know what will begin after an ending. While homo sapiens have been down similar paths we have not been down this specific path before. It is helpful to look at the long arc of history. We are at a pinnacle (it appears) of human population, technological innovation, and knowledge of our cosmos at both the macro and micro levels. We are also at a pinnacle (it appears) of fossil fuel extraction and our planet's ecological limits. It is all pretty amazing. All of this will end. But right now it is awesome. Here I am in my jammies communicating with all you good folks through techno-magic that I don't understand. We are likely in for some instruction. That instruction will be in how to ride the downside of the curve consciously. We will learn as we go. I have a few personal goals. I hope to be aware and awake. I hope to face reality and not deny it. I hope to be a non-anxious, compassionate presence. I hope to be courageous when I need to speak truth to power. I hope to be wise enough to let go when I need to let go. I hope to experience joy. I hope to honor suffering (my own and that of others). And I hope for one thing I likely will not see. 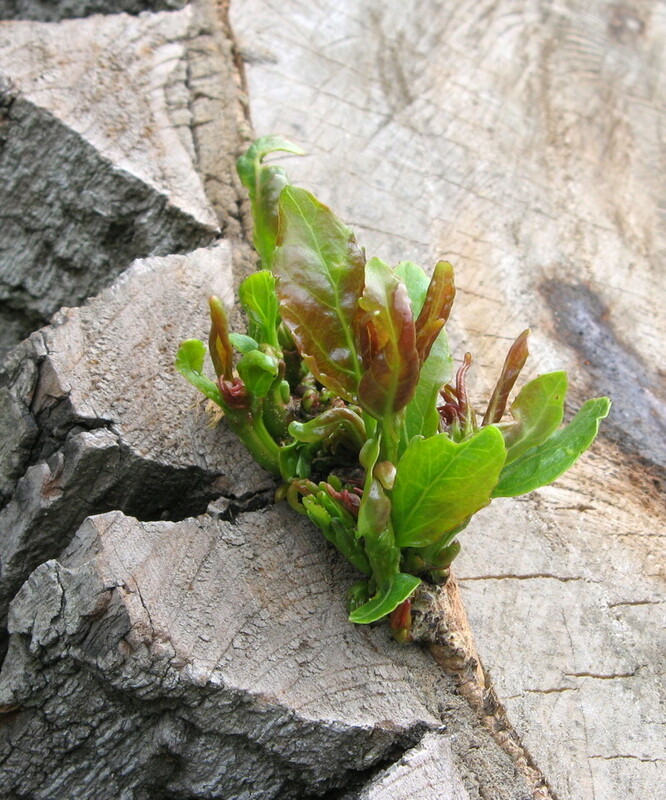 I will hope that those green shoots will be strong and filled with life and promise. My whole life I've lived in fear of Apocalypse. My grandparents, were children of the Great Depression and planned ever since for The End - including stock piling beans, bullets and Band Aids. It's been an interesting way to grow up. But as a grown up grown out of all that fearfulness, I've turned my face from all Apolcalyptic messages because fear gets old after awhile. All that changed this morning. You wrote an Apocalyptic message that was beautifully said and full of non-cliche hope. Thanks for relieving some fear. I appreciate this message and awareness and feel more courageous to open my eyes and face the truth. Thanks Pastor Shuck aka Juan el Bautista :) Your courageousness helps the rest of us be more courageous. I think so. Thanks again. Great post. In the Benedictine sect they strive to "keep death always before [your] eyes." Awareness of your impermanence is required for true enlightened happiness. Wow, Jennifer and Max, thank you both for the kind words. Blessed be.